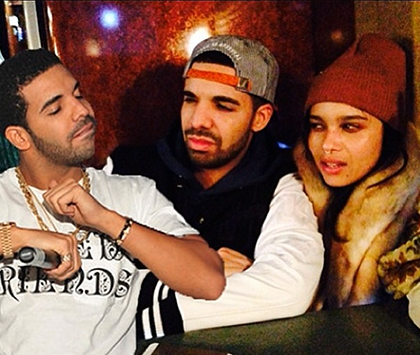 Drake and Zoe Kravitz all over each other at a club in Toronto. Now that we know things are over (and slightly awkward) with Rihanna, has Drake found himself back in familiar arms? E! News has learned that the rapper attended former flame Zoë Kravitz and her bandLolawolf's show in Toronto at the Mod Club earlier this week, and while it could definitely just be one pal supporting another, a source tells us that there seems to be much more going on. In fact, the pair were seen hanging out again the following night. "Drake and Zoë hung out last night," the insider tells E! News, "They were all over each other." But don't go calling her Drizzy's girlfriend just yet. The source continued to note that whatever is going on between the pair is nothing with a title, "They're clearly hooking up. Nothing exclusive. They both travel the world, have millions of dollars. They have fun together." Lolawolf's Twitter account tweeted a photo of Drake with the band's drummer from their June 3 show and wrote, "Thanks for comin out last night @Drake • lotta love Toronto." Romance rumors between these two began swirling late last year when a photo of the OVO star in his tour bus with actress was posted on the rapper's fan site. ET Canada alsotweeted on Oct. 31, "Could Drake have a new lady in his life? The rapper was spotted packing on the #PDA with Zoe Kravitz while the two were in Toronto." However, with time the sightings of the duo began to decrease and his appearances with RiRi were on the rise. Kravitz also began dating Noah Gabriel.